"sansnom. debuted its Fall/Winter 2017 collection with the news that this will be the label’s final release. Dubbed “No Finish Line,” the brand commemorates its resolution with a 48-hour pop-up. The Pop-Up takes place in Lyon from the 17 to the 18 of November. The monochrome collection consists of of wardrobe staples, indicative of sansnom.’s approach to understated technical gear suited for daily life. In line with the brand’s sense of quality, swiss yarn is utilized for the brand’s knitwear, while technical fabric for the pants and outerwear is sourced from Germany and Japan. Items include a variety of logo hoodies and sweaters, as well as items printed with “DON’T SLOW DOWN” and “ADRENALIN,” in line with the season’s theme, which relates to the message of positivity at the core of sansnom. Spring/Summer 2017. The collection’s guiding principle centers around the concept that life is similar to a race, wherein one has to bounce back following defeat, but it’s also a continuous learning process. A runner’s water bottle, produced alongside Switzerland’s SIGG, keeps in line with this motif." The private pleasure taken in the journey of starting something is as exciting as the things we are trying to create. Starting something is meeting people. People doing what you’re doing – starting – though, in their own lanes, in their own times. Everyone emerges from a different comfort zone. Some people will find what you’re starting to be uninteresting. They will tell you the fashion brand you founded is silly because there are already plenty of those. Good point. What they fail to grasp is the journey’s richly nourishing highs and lows, winding, curving roads, and steep, rugged cliffs that feed you only once you have set foot on them. One thought that guides us is the unspoken form of mutual respect and appreciation found between individuals who have started something on their own. This portrait series is an ode to some of the people we have met along our journey, and the amazing things they are doing. An homage to what they have started. A procession of faces that you might already know, or maybe will know one day, which we hope will inspire your next start. Alongside photographer Wendy Huynh, we imagined a creative bridge connecting Lyon with London. As Wendy’s home base and the city where several of our good friends live, London made the ideal backdrop for this multicultural exchange as we brought our experiences from our hometown, Lyon, across the English Channel. Now let’s meet the starters. A long-lasting friendship turned into a business partnership, a fully-fledged idea of sportswear and a name that crosses any categorizations. These are some of the elements that make up sansnom.‘s identity, a new player in the sportswear game. Just a couple of years ago, Yoann Wenger and Romain Sabatier kicked off their label with a cutting-edge mission in mind. Filling a gap they felt was evident within the French activewear industry and offering products able to mix the functionality and performance features of sports gear with the comfort of urban clothing. And to achieve this, no compromise is needed according to sansnom.’s founders and creative minds. Simple, timeless designs and performance constructions are paired with premium materials and ultimate French craftsmanship, for a range of products which provides the ideal city uniform. The inspiration for the label’s collections reflects sansnom. dual purpose. It feeds on sports’ genuine values such as ambition, competition and hard work and on the daily needs Romain and Yoann experience as modern men living the urban space. The same attitude you find in their latest FW16 editorial, named ‘Motion’, a powerful series of blurry, black-and-white shots by photographer Thibaut Grevet. The overall idea for this editorial is portray a casual day at the court while showing the tension and speed of movement of the game. We aligned with Yoann and Romain to get to know more about this up-and-coming label. From the reason behind its name to the main challenges of running a brand at such a young age, we shed a light on what makes sansnom. different from any other brand around. Shots to fell the tension ans speed of sport. sansnom. is basically modern sportswear, which means clothing focusing on technicality, functionality and comfort at the same time. Designing basic and yet interesting clothes, suitable both for performance and the urban life. When starting sansnom., did you feel like there was something missing in the sportswear industry or did you want to introduce a new approach to activewear? We felt something was missing among the French brands available at the time. 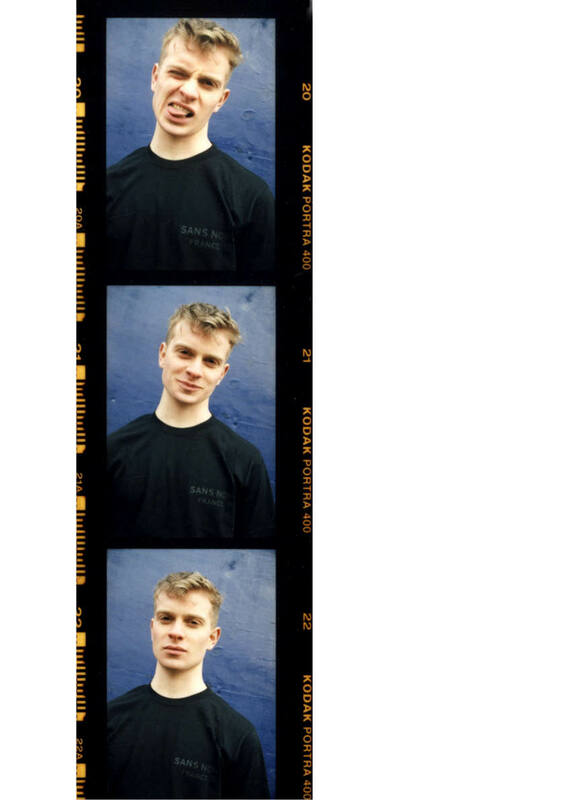 But most importantly, how we came to sportswear is something very organic because we started by printing t-shirts when we were sixteen. Back then, with sansnom. we were trying to find what we’d like to wear and to create something representative of sports values and sportswear. Like clothing more focused on city functionality but still being suitable for everyday life. What has been inspiring your work the most? Actually the inspiration for our brand came from our direct personal experience, from our daily needs. So daily life is the element which has been affecting our work the most. Of course, as we grew up, our inspirations have changed. 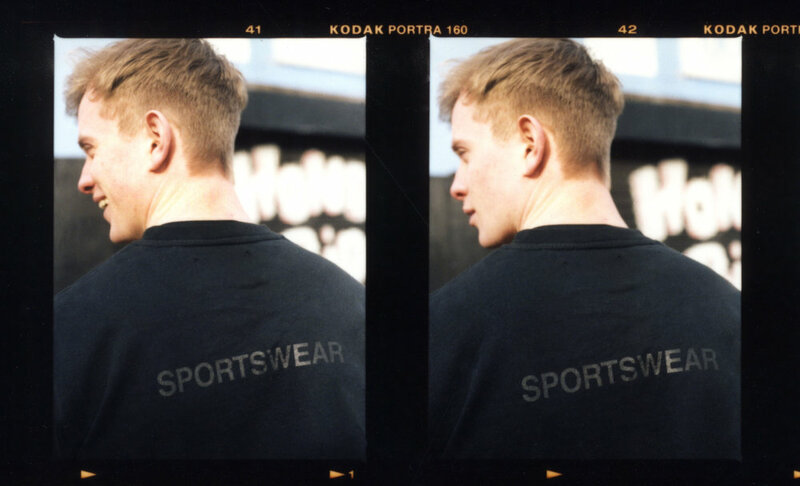 It’s difficult to find something specific when it comes to inspiration, but I think that sports values have been a constant inspiration for the identity of the brand, which is not strictly related to clothing itself but it’s rather a global idea dealing with ambition and competition. What are the most important features of the sansnom. products? What makes them different from the products of the other brands around? I give you an example. Let’s take the technical jacket, that was quite a big challenge for us because we managed to make it entirely in France. You have three-layer jackets from many other brands, which are made from amazing fabrics. But what we did it’s actually taking a more seasonal approach to make a very good jacket and made in a very small factory. So you have an amazing technical product which expresses a very specific French savoir-faire. It was a big challenge for us and we are very happy with the result and the design. Maybe that’s the best product we’ve been doing so far, together with the Repellant Pants we introduced with this season. The fabric is amazing, it’s from Japan, it has a cotton touch but it is entirely repellent. So it provides weather protection and still looks very elegant. We think these are the main features of the brand’s products, they are weatherproof and yet elegant, and totally made in France. It seems like the brand owns a very well-defined identity, and yet you have a rather neutral name, meaning ‘nameless’. Why did you decide to go for it? To be honest, when we launched sansnom. we were young and still in high school. At that time, we were just trying to find a good name for our brand, but we couldn’t find one. We came up with this name because we wanted one that could make people laugh at first, so we could introduce the brand in a happy way. Basically that was the idea, and then it became something stronger and I think this name gives us the ability to do whatever we want as we are not closed in one specific kind of concept and style. It’s like our brand is a blank page which gives us the chance to experiment. You started sansnom. recently, what have been the main challenges of building and running your clothing label? I think the biggest challenge with starting a brand nowadays is approaching your work in the most authentic way possible, it’s very hard to spread the right message. And when you start a brand at a young age, which is our case, it is complicated to follow both the part related to the product and looking after the business side of the company. Overall, starting a brand is quite a challenge, but also one of the best ones, it’s an amazing experience. You’re costantly learning every aspect of the business and building experience on your own, every single day. "I wanted to show my vision of this sport by something abstract and blurry, where you can really feel the tension, the speed of it." You’ve just come out with your latest FW editorial, named ‘Motion’. What’s the idea behind it? Our latest editorial ‘Motion’ revolves around basketball essentially. But the idea behind it is showing the story of ordinary human beings that are sport-addicted or that consider sport as an integral part of their lives. We wanted to show how a casual Sunday at the park looks like, which is basically the typical kind of Sunday we spend, just chilling around playing basketball or football. And we wanted to portray this in a very artistic way. We were fascinated by the movement and by blurry, black-and-white pictures. We’ve been talking a lot about this with Thibaut Grevet, the photographer, and we were inspired by the work of Martin Munkasci, by the feeling of sport animation of his shots. What we wanted to convey is the feeling of movement that you have in sport through photographs. Is there a specific reason why you chose New York as the landscape for your editorial? We think New York has something very particular with basketball. It’s a very symbolic place for the orange ball and the truth is that things happened in a very organic way. Thibaut, who’s a great friend of ours, happened to be in New York and we had been talking about this kind of project for quite a long time. It was the best moment to do it, and we decided to do it last minute – which usually is the best thing – and thought the big apple was the best place to portray basketball. It seems like there’s a great energy between you and Thibaut Grevet. How did you guys first connect? We met in Lyon, and the amazing thing about this city is that good people tend to connect and work together in one way or another. With Thibaut, we started working together for a video shooting maybe three years ago now, and since then we’ve been working very closely and we’ve become fast friends. 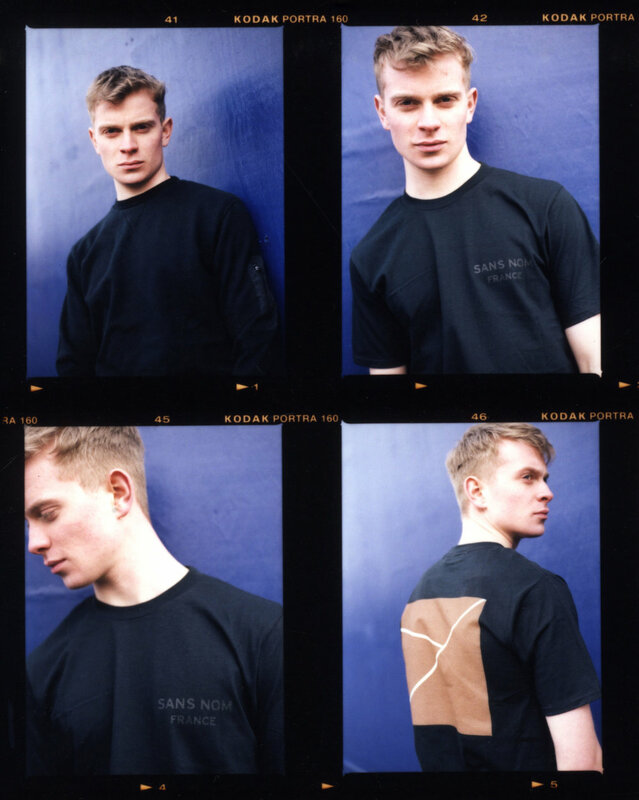 He is a very strong partner in sansnom.’s DNA as he’s been contributing to the brand’s identity with his shots and look books. We make a very strong team because we understand each other very well. I just boost some ideas with Thibaut and I know he’s going to be the right person to interpret them, it’s very easy to work together and it also happens very naturally. What are some of your favorite sansnom. pieces? 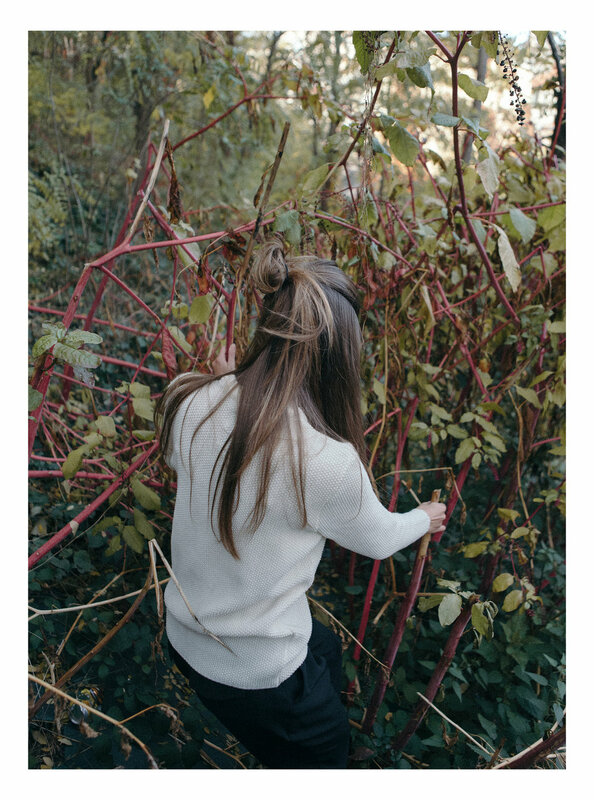 Knitwear represents very well our works, it is made 100% in France like all the products we do, and it’s made in a factory that we really like. We always have a good feeling about the knitwear. Also the two pieces that we introduced this season, which are the Gym Tech Top and the Underlay Hooded Sweatshirt, these are the kind of products that we want to propose by now. They are constructed with a particular kind of layering and mix up nylon and Japanese fleece, which is amazing. I would say the Repellant Pant and the two cut-and-sewn sweatshirts. For our second short film, we decided to take a step further into the sportswear dynamic by portraying the journey of two completely different lives and men reunited under the same values : ambition, competitivity and passion. The short film is dissected in 3 different parts and times that reflects each values. LET THERE BE LIGHT collaboration with Summer Store. "French brand sansnom. presents its very first collab, inviting Lyonnaise retailer SUMMER to redesign one of its FW15 hoodies. SUMMER’s contribution makes reference to the Lyon “Festival of Lights” the 8 of Decembre. According to local tradition, Lyon’s residents place candles on all of their window sills, creating spectacular nighttime light displays when they’re all lit up." "French sportswear label sansnom. have released a Fall/Winter 2015 editorial entitled, “The Neighborhood Girl,” which includes select pieces from the brand’s latest seasonal release. Shot by photographer Thibaut Grevet in close proximity to the brand’s new le Quartier Saint Georges headquarters near Lyon’s city center, the editorial attempts to imagine the perfect girl next door. Relaxed silhouettes and laid-back items espouse a breeziness associated with a trip to the corner store. Made in France and Portugal, dyed sweatshirts, pocket T-shirts and cozy knitwear run contrary to the superficiality of French fashion."